For first time visitors to Japan, Tokyo is usually the first place you stop, and with good reason! Indeed, there are many exciting things to discover in Tokyo—some of which will be introduced in this very article. However, if you stick to the well-known “Golden Route” (Tokyo to Kyoto to Hiroshima) you’ll miss some of the best spots in Japan! On my blog I always try to show you some of the regions and places that are off the beaten path. I’ve traveled to all 47 prefectures myself, and obviously I also started out with the most popular sights. But if I’m completely honest, I found the most breathtaking views elsewhere. If you take Tokyo as your base, you can either do some day trips or travel quite far to explore a completely different region of Japan. I’ve done exactly that in late 2017 to show you around in Miyazaki Prefecture in Kyushu. And I did it again in late 2018. This time I went to Okayama Prefecture. Okayama is located in Japan's Chugoku region. In fact, you’ll pass by if you take the Shinkansen from Kyoto to Hiroshima. Okayama also has a station at which Japan's bullet trains stop, so it makes sense to get off and explore that region as well. The following is a sample itinerary that will show you what you could do in Tokyo in a day and how to move on to Okayama. I’ve been to Okayama many times before, so most of the sights I’ve already explored previously. However, the photos I’m sharing here are all from my most recent trip. Tokyo Skytree quickly became a symbol of modern Tokyo, and is the perfect place to start sightseeing. With its height of 634 meters (about 2,080 feet! ), it’s even higher than the famous Tokyo Tower. The height is not random, but is referring to the name of the region where the tower is located: Mu (6) sa (3) shi (4). There are two observation platforms, and you have to pay for each one individually. On the highest platform there are always some kind of exhibitions going on, often anime-themed. So, if you’re interested in the current exhibition, I’d say it’s worth the extra money. On clear days the view is absolutely stunning, and you can even see Mount Fuji. In the evening you can enjoy the bright city lights of Tokyo. Be aware that you might have to line up for hours if you go on a busy day, especially in busier seasons like summer. However, there are Fast Skytree Tickets that you can buy ahead of time. The only problem is that the date is fixed, and if the weather is bad Tokyo Skytree might not be worth the visit. On the lower floors of the tower you’ll find the shopping mall Solamachi where you can buy souvenirs, snacks and other things. There are also a lot of cafés and restaurants. On the 30th floor of Tokyo Skytree you’ll find a restaurant called Shokkan Solamachi. Not only do they offer a nice selection of dishes, you’ll also get a breathtaking view from up there. Of course, you pay for that view—but the lunch set I got (with sashimi) was still quite affordable, at about ¥2.800 about US$25.76). If you’re interested in history of the metropolis Tokyo that was formerly known as Edo, I recommend a visit at the Edo-Tokyo Museum. It’s just a short train ride away from Tokyo Skytree. The museum offers several replicas of former buildings of Edo/Tokyo. Some of them are even in original size such as Nihonbashi. It’s very interesting to see how Edo managed to build itself up again and again after natural disasters and war destruction. As the museum gets a lot of foreign visitors, you’ll find detailed information in English pretty much everywhere. Surprisingly you’ll find a lot of beautiful landscape gardens in Tokyo. You just gotta know where to find them. Especially during cherry blossom and autumn color season it’s a great idea to visit these kind of gardens. However, try to avoid the weekends as they tend to get crowded. Rikugien is only about a 10-minute-walk from Komagome Station. It’s a spacious Japanese landscape garden with a lovely teahouse. You should take a break there and try the matcha and wagashi (Japanese sweets) set while enjoying a beautiful view of the garden. The name of the garden literally means “6 poems garden." In fact, the garden displays 88 different scenes of very well-known poems. Please keep in mind that it gets dark quite early in Japan in autumn and winter. Most tourist facilities close around 4 or 5 p.m., so try to see everything you want before then! If you’re in Tokyo during Halloween you should consider going to Shibuya. In recent years it has become the most popular spot to gather up and display your costumes. You can take lots of interesting photos. However, lately it’s become quite crazy. More and more, police officers have to be positioned around Shibuya Station to try to make sure things don't get out of control, so be careful. It’s so hard to decide where to stay the night in Tokyo. The best choice is usually along the Yamanote Line. Shimbashi Station is one option and is also very close to Haneda Airport. Only a few minutes from the station you’ll find the Daiichi Hotel Annex, where I stayed for two nights. As convenient as they are, hotels with such a good location are usually a bit more expensive. Alternatively, you can look for hotels around Kamata, Kawasaki or Yokohama. They are often a bit cheaper and you still have great connections to central Tokyo and Haneda Airport. If you want to travel from Tokyo to Okayama, your best choice is to take one of Japan's awesome bullet trains! It takes about 3.5 hours, and the journey is fully covered by the Japan Rail Pass. After arriving at Okayama Station it was time for lunch. On the main road that leads from the station to the main attractions of Okayama City (see further down), there are several restaurants. However, I suggest you peak into the side streets as well. Often you’ll find the more authentic and cheaper options there. And that’s how I ended up at Ajitsukasa Nomura, which has been in business for 80 years and been in the same family for four generations. I recommend you order the tonkatsu pork cutlet. They serve it with a special demi glace sauce, which is the best I've ever had! It’s their secret recipe and you won’t find a sauce that tastes the same anywhere else. After lunch I visited the famous garden Korakuen which is one of Japan’s three most beautiful landscape gardens. I’ve been to all three of those gardens and have to say that Korakuen is by far my favorite. I’ve visited the garden many times and in different seasons, and I explore something new every single time. But one of my favorite aspects of Korakuen is that you can see Okayama Castle, majestically in the background. To get to the garden you can either walk for about 30 minutes from Okayama Station, or you can simply take the tram. I’m a huge fan of Japanese castles, and Okayama Castle is no exception. One feature of the castle is its black exterior, which has earned it the nickname “Crow Castle,” as contrast to the nearby “White Heron” Himeji Castle. However, unlike Himeji, Okayama Castle doesn’t have an original castle tower anymore. The tower was destroyed during WWII and then reconstructed in 1966. The castle tower is beautiful nevertheless. Inside you’ll find a few exhibits and you can also wear traditional clothes (e.g. kimono) and take photos inside wearing those. To be honest, the castle is a lot more spectacular from the outside. That said, from the upper floor you do get a stunning view of the surrounding moat and Korakuen Garden! At Kidoairaku I was able to have a very special experience. A quite famous sushi master taught me how to prepare several dishes mainly using sushi rice and raw fish. I also learned how to cut a cucumber to create nice decorations, and how to really hold and use chopsticks when eating nigiri sushi. Even the Japanese people accompanying me didn’t know that yet!! It wasn’t easy, but it was a great experience! After working hard (and trying not to cut my fingers! ), I was finally allowed to try my creation. Needless to say it was delicious! Unfortunately it’s hard to get to the restaurant via public transportation. However, you could take a taxi from Okayama Station which isn’t too expensive. The fastest option to get to Bitchu-Takahashi from Okayama is to ride the Yakumo Limited Express. The ride itself takes about 35 minutes, compared to local trains, which are cheaper but take about an hour. In autumn from about 7 - 9 a.m., visitors can enjoy the mystical phenomenon called unkai, which literally means "Sea of Clouds." It is so-named for the fact that the scenery is suddenly swallowed up by a dense ocean of clouds, with only the tips of nearby hills visible. On one of those hills you can see the famous Bitchu-Matsuyama Castle. Unfortunately there weren't as many clouds as usual when I visited, but the view was still quite impressive. You can take a special taxi from the station, which can be shared with other people to reduce the cost. A round-trip costs about ¥1,500, and takes about 20 minutes. This shuttle can be reserved at the station. Speaking of Bitchu-Matsuyama Castle, it's quite famous, since it’s one of the oldest castles in Japan. Only 12 original castles towers remain. Himeji Castle is one of them. However, Bitchu-Matsuyama Castle is the highest among them all. More than enough reasons to visit! In order to get to the castle, you could walk from the station, but it’s about five kilometers (about three miles) and it's a pretty steep way up. Alternatively you could take a special taxi that runs from the station to the castle several times a day. Again you can share it with other people. A one-way ride costs about ¥500 and it takes about 10 minutes. From the parking lot, you have to hike up for about 20 minutes. While it's unfortunate that the grounds aren't barrier free, it is an original castle tower, and is known as the highest one, so prepare accordingly. While hiking up you can enjoy the views from up there. Along the way you’ll see the remaining castle walls which are quite impressive. I was told that recently there’s also a cat which greets you if you’re lucky. This wasn’t a thing when I visited many years ago. And this time we were told the cat was “off duty” due to a vet visit. Cats in Japan sure are busy! There are also a few samurai residences in Takahashi City which I didn’t revisit this time. Not too far away is the restaurant Uotomi. They offer a huge variety of typical Japanese dishes. As it was quite cold the day I visited, I went with a hot udon soup and some sashimi. Perfectly hit the spot! Hina Dolls are set up at the beginning of March during the Hina Matsuri, which is a family's way to celebrate women in their family tree, specifically daughters. These dolls can get quite expensive depending on size and design. I was able to visit a workshop where I learned how Hina Dolls are produced. It was very interesting to see how many single working steps are necessary, especially finer details like the fact that attaching the head is the last step. While I learned a lot, I think such a workshop only makes sense if you can understand Japanese or have a translator on hand to help. Our next destination was also tucked away in the mountains. To get to this hidden place, I was able to ride what is probably one of the oldest buses still running in Japan. The ride itself took about 90 minutes. Fukiya Furusatomura is famous for bengara, which is a color pigment made from oxidized iron. The color is reddish and you can see these red color shades throughout the entire village, especially when looking at the roof tiles. There’s a tunnel leading to a mine in town, but unfortunately I didn’t have enough time to go in there. With the bengara color pigment you can do a lot of things, and so they also sell bengara-dyed clothes and goods. I even got to print my own design on a tote bag using bengara colors, which was a lot of fun! After a long day of exploring Takahashi City I finally arrived at Tsurugata. It’s a traditional Japanese ryokan, with tatami mats, a public bath and, of course, futon to sleep on. The building is the second oldest within the historical quarter of Kurashiki. Dinner was actually served in my room, which was a first for me at a ryokan. Thus far I’ve only been served breakfast in such facilities. I got to enjoy several different dishes, each of them prepared with so much love of detail. The ryokan has been praised for its exquisite dinner, and indeed it was very delicious. In the morning I woke up to the stunning sight of my own private Japanese garden. Right after breakfast I was able to start exploring the area around the Kurashiki River canal, as the guesthouse is located right in the historical area of Kurashiki. Kurashiki is often called the “Venice of Japan," and if you’ve ever seen photos, it's easy to see why. 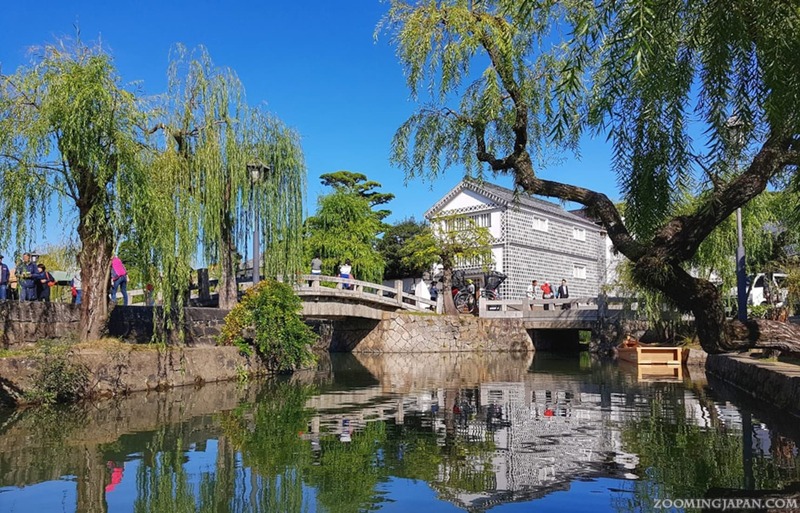 Along the Kurashiki River you’ll find several historical buildings, art museums as well as small, cute cafés and restaurants. You can also take a boat tour in the river. The tour is very short, but you’ll get to experience Kurashiki from a different angle. If you have time, you should try it. One of my highlights from this town is the toy museum. I visited it many years ago, and it was fun to go again. You’ll find a huge selection of toys, dolls, masks, kites and a lot more from different periods and regions of Japan. As there are so many cute options, it’s quite hard to decide on one café. Eventually I went to Kudamono Komachi Parlor. Kudamono means “fruit,” and that’s exactly what you’ll get there. Delicious fresh fruit with pancakes, smoothies or even parfaits. There was outdoor seating in front of a bamboo forest, as well as second floor seating with tatami mats from where you can enjoy the view. The waitresses are wearing cute costumes. Even the design of the menu is really adorable! While you could easily spend all day exploring Kurashiki, I had one more destination to check out that day. You can do several different cycling tours in Okayama. A very popular one is the Kibi Plains Cycling Tour. Usually your starting point is Bizen-Ichinomiya Station. From there you’ll come across various Momotaro monuments, shrines and temples. After all, Okayama is famous for the legend of Momotaro, and during the tour you’ll learn more about it. Your eventual goal is Soja Station, where you can return your rented bicycle. From there it’s just a short train ride back to Kurashiki or Okayama. However, if you have a bit more time, I recommend checking out the “Demon’s Castle” which is also in Soja. After cycling so much I was obviously very hungry. In a nearby building of Kurashiki Station on the top floors, you’ll find several restaurants. I ate at Hamura Chaya, from where you have a stunning view onto the surrounding area of Kurashiki Station. I was served several small dishes so that I could try a huge variety without overeating. That’s something I really like about the Japanese cuisine. Their special dish was a sesame tofu called kuzuan. It was really delicious. At this point the short side trip from Tokyo came to an end. Of course, I could have continued my journey by either going to Hiroshima or the other direction to Himeji and then Kyoto. As I’ve been to all these places already, there was no need. But that’s something that you could and should do if you have the time to. Hopefully this will motivate you to give Okayama a try if you ever visit Japan (again). Like I said, it’s a bit sad if you only stay in Tokyo the entire time. Instead of visiting the overcrowded top tourist destinations in Kyoto, it’s always good to have a few alternatives up your sleeve. Have you ever been to Okayama? How did you like it? Zoooming Japan does what the title implies: it zooms Japan, bringing it closer to everybody and offering a lot of details about the country. The website focuses on traveling in Japan, but also has a lot of other interesting information concerning daily life (e.g. how to obtain a Japanese driver’s license) and culture.